Obituary for Wilma A. Sportel | Langeland Family Funeral Homes, Inc. Went to be with her Lord, Tuesday evening, May 1, 2018. Wilma was born September 27, 1933 in Kalamazoo the daughter of the late Steven and Adrianna (VanDyke) VanZanten. 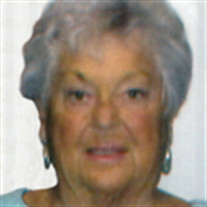 Prior to her retirement she was employed for several years with KVISD(KRESA) in the accounting department. She was a member of Second Christian Reformed Church. Wilma was preceded in death by her first husband, Nelson Groenheide on September 1, 1953. On June 24, 1955 she was united in marriage to Adrian Sportel, who preceded her in death on December 13, 2003. Also preceding her in death was her sister, Carol Modderman. Wilma is survived by her children, Tom (Penny) Sportel, Teri (Mike) Benthin; 3 grandchildren, Shaun (Jenny) Sportel, Matt (Liz) Sportel, Tori Wellington; 3 great-grandchildren, Sienna, Sawyer, and Mason; and many nieces and nephews. A memorial service will be held at 11:00am Thursday, May 10 at the Langeland Family Funeral Homes, Westside Chapel, 3926 South 9th Street. Friends may meet the family from 6-8pm Wednesday, May 9 and from 10-11am Thursday prior to the service at the Westside Chapel. Private family interment will be in Boughton Cemetery in Scotts. Memorials may be directed to the Galesburg-Augusta High School and Schoolcraft High School Athletic Departments. To view Wilma's personalized guestbook please visit www.langelands.com.